- Aleka Allen on 九月 13, 2016. Tis the season — TIFF season that is! Once again, our city has turned into a frenzied wonderland of films, glamour, and celebrity sightings galore for the 41st Annual Toronto International Film Festival. From Thursday, September 8th to Sunday, September 18th, 2016, over 4000 movie lovers and professionals in the entertainment industry will be up to their necks in high profile film screenings, attending a never-ending stream of parties and industry events, and hopefully catching a glimpse of their favourite Hollywood actor, actress, or director walking the red carpet. As one of the world’s most premiere film festivals, it seems only appropriate to kick off this ten-day long movie fest in class and sophistication. On Thursday, September 8th, 2016, Fashion Ecstasy had the pleasure to attend the opening night party for La Maison Moet. This champagne reception was sponsored by Moet et Chandon, ‘the champagne of cinema’. The venue for this splashy shindig was La Maquette, a really cute, two-storey, Art Deco building located in the King East district. A five feet tall bottle of Moet et Chandon sitting in a white porcelain tub was the first thing guests saw upon entry into the party. The opulent display made for many fun selfies and photo opportunities throughout the night. The champagne flowed like a river of pleasure throughout the party. Guests got to enjoy their glasses of bubbly in large, gold goblets, which just added to the party’s posh atmosphere. There were a handful of local celebrities in attendance that night. 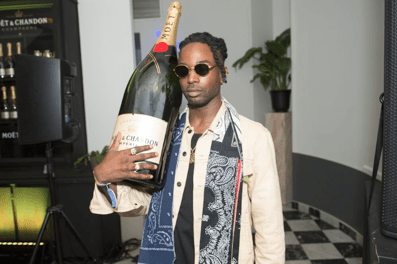 Some of these celebrities included Canadian musicians Fefe Dobson and Jazz Cartier, comedian and Youtube personality Jus Reign, and fashion blogger Jay Strut. The awesome, although slightly too loud, music was provided by A-list DJs Hannah Bronfman and Lissa Monet. The night was filled with dancing and mingling into the late morning hours. While it was a fun and glamourous event, it needed something more interactive for the guests. Imagine if the massive champagne bottle in the tub display was a photo booth and the pictures end up on the event’s official social media platform! Something interactive like that would elevate the party’s atmosphere and engage guests who want to do more than just drink and scream above the music. Other than that, it was one of the most glamourous TIFF parties this year and it was such a pleasure to attend. La Maison Moet.runs during the first weekend ofTIFF2016 And is the perfect place to stop by for a glass of Champagnea and recharge forTIFF Madness.